* 蜿ｳ蜀咏悄�ｼ�Garsington Manor�ｼ牙�ｺ蜈ｸ�ｼ� R. Clark's B. Russell and His World, 1981. My relations with Ottoline had been in the meantime growing less intimate. In 1915, she left London and went to live at the Manor House at Garsington, near Oxford. It was a beautiful old house which had been used as a farm, and she became absorbed in restoring all its potentialities. I used to go down to Garsington fairly frequently, but found her comparatively indifferent to me. (Some of my letters to Lady Ottoline, written during the early years of the War and reflecting the state of my mind at that time, are to be found on pages 276-282, 285-288 and 293-294). I sought about for some other woman to relieve my unhappiness, but without success until I met Colette. After the police court proceedings I met Colette next at dinner of a group of pacifists. 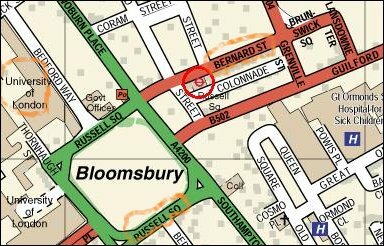 I walked back from the restaurant with her and others to the place where she lived, which was 43 Bernard Street, near Russell Square. I felt strongly attracted, but had no chance to do much about it beyond mentioning that a few days later I was make a speech in the Portman Rooms, Baker Street. When I came to make the speech, I saw her on one of the front seats, so I asked her after the meeting to come to supper at a restaurant, and then walked back with her. This time I came in, which I had not done before. She was very young, but I found her possessed of a degree of calm courage as great as Ottoline's (courage is a quality that I find essential in any woman whom I am to love seriously). We talked half the night, and in the middle of talk became lovers. There are those who say that one should be prudent, but I do not agree with them. We scarcely knew each other, and yet in that moment there began for both of us a relation profoundly serious and profoundly important, sometimes happy, sometimes painful, but never trivial and never unworthy to be placed alongside of the great public emotions connected with the War. Indeed, the War was bound into the texture of this love from first to last. The first time that I was ever in bed with her (we did not go to bed the first time we were lovers, as there was too much to say), we heard suddenly a shout of bestial triumph in the street. I leapt out of bed and saw a Zeppelin falling in flames. The thought of brave men dying in agony was what caused the triumph in the street. Colette's love was in that moment a refuge to me, not from cruelty itself, which was unescapable, but from the agonizing pain of realizing that that is what men are. I remember a Sunday which we spent walking on the South Downs. At evening we came to Lewes Station to take the train back to London. The station was crowded with soldiers, most of them going back to the Front, almost all of them drunk, half of them accompanied by drunken prostitutes, the other half by wives or sweethearts, all despairing, all reckless, all mad. The harshness and horror of the war world overcame me, but I clung to Colette. In a world of hate, she preserved love, love in every sense of the word from the most ordinary to the most profound, and she had a quality of rock-like immovability, which in those days was invaluable.